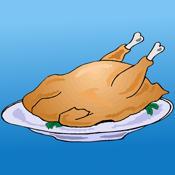 Meat Cooking Times is a utility which can be used to calculate the length of time to roast meat in an oven. Please note that the times calculated by this app are for guidance only. Cooking times may vary according to the oven used. Use this app by entering the weight of the meat (metric or imperial), selecting the type of meat and then pressing the “calculate” button. The total cooking time in hours and minutes, recommended cooking temperature and recommended internal temperature are then displayed. The maximum allowed weight is 10kg or 22lb. A “custom” cooking time option is also provided. Enter a cooking time per 450g or lb and then press the “calculate” button to display the total cooking time.